The yellow cake tests are done! The winner was Shirley Corriher’s cake, but if you have the ingredients on hand for any of the cakes below, they are all worth making. 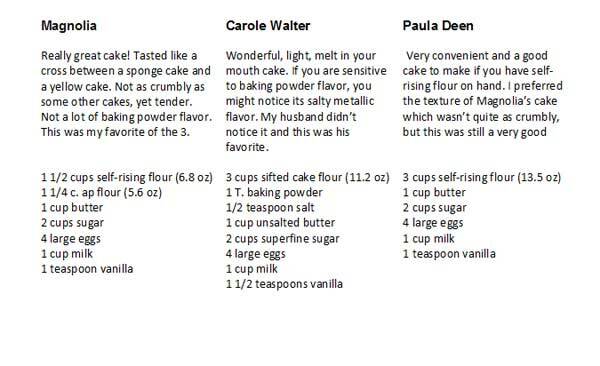 If you like charts, here’s are some at a glance tables showing the ingredients in the cakes I tested. 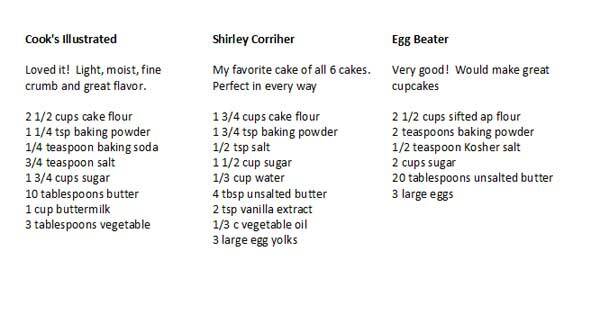 I’ve used a few of Shirley’s cakes, but the one I liked best was the 2 stage method. Now that I’ve learned that method, I look for recipes that use it. Another really good yellow cake which uses the 2 stage method is this one. I’m looking forward to hearing how your frosting experiments go. I am SO glad you posted this. I just made Corriher’s cake and it was amazing (but it overflowed). I love to try different versions of recipes. After reading about all the buttercreams in BakeWise, I’m going to do a buttercream test soon on my blog. Which method did you use? Corriher has the 2-stage, creaming, and dissolved sugar methods all in her book. I’ve been buying Rumford on a regular basis lately. You are right. There’s definitely less (if any) aftertaste. About Shirley’s cookbook, it’s a great reference. Some of the recipes are better than others, but all have been good. I think you will love the cake. I remember checking out Shirley’s cookbook a couple years ago, but all I made out of it was the Fire Crackers! Imagine that, picking like the only non-dessert recipe, lol. I hope to make her magnificent moist golden cake soon. Oh, and a tip on the baking powder–buy Rumford, which is aluminum-free and won’t add an aftertaste. I had to learn that the hard way when I had similar yucky aftertaste problems with yellow cake. I’m so glad you did this. I’ve never had luck with a yellow cake but I made your winner tonight for my 8 year old daughter and 40 year Old husband. Big hit!! Wow! you have done your homework. I was just talking to my husband about how we should bake a yellow cake one of these days and here all of the work to pick out a recipe is done for me! Thanks, Anna. I love your cake comparison. Loved reading about all the cake recipes! Shirley C. is awesome! What a coincidence that you’ve been doing posts on yellow cake! 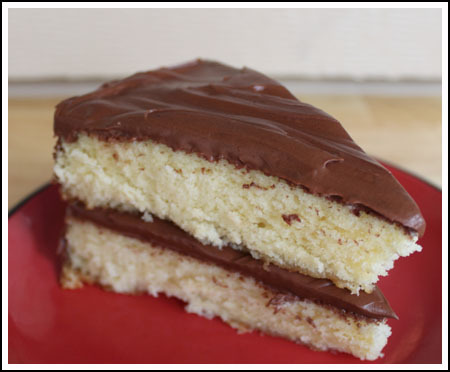 2 days ago I made my makeshift version of yellow cake with chocolate ganache frosting but it didn’t work well as a cake, so I’ve been looking for a good recipe, and these look very promising. 🙂 I’ve heard that Rose Levy Beranbaum’s version is good as well, can’t wait to try all of these variations. Anna – I love this comparison and am inspired to try Shirley’s recipe (I have Bakewise but have yet to try that recipe). This is incredibly helpful, thanks for taking us through the various trials! What a comprehensive guide! Thanks for doing all those tests! Wow, that’s a fabulous looking yellow cake. I love yellow cake! Last summer I even made yellow cake flavored icecream. I love the new layout. And the cakes look amazing; I want to eat them all now and it’s only 6am. Love the new website! Thanks for testing out all those cake recipes, I will definately follow your advice and make shirley’s! Love the new layout and the new photo in the header!! My mouth waters every time I look at all these cakes! I can just taste them! Ha, maybe I’ll actually make one at some point… 🙂 Thanks Anna! I was trying to type a comment yesterday and it timed me out. Hopefully that issue will resolve itself soon. I’ve been having odd issues like that lately. Oops, I see the first comment did not go through. Did I talk too much?? Love that you do these tests…then I don’t have to! Anyway, saving Shirley’s yellow cake mix recipe! Not certain whether my comment got through or not. Something came on and told me I was “timed out”. Let me know, will you Anna?